It sure doesn’t look like 3 hours of cleaning….. 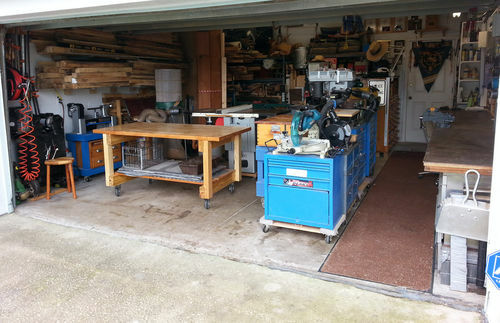 Always nice after a cleanup…the calm before the storm of more sawdust and cutoffs. I dont bother to “clean”. I OCCASIONALLY vacuum, and usually just REARRANGE the clutter! I guess that you cleaned up the shop for a dinner party tonight on that new magnificent maple top table ! You must feel good after those three hours well spent. Now, how about a paint job on the concrete floor, what I’ve been doing for the last five six in my basement shop ? Eric, Looks good from here. We need before and after pictures. Much too clean. I never trust a woodworker that has a clean shop, he must be hiding something! Now make it messy. Oh now I know, you just moved into that new shop didn’t you…now go to work and make a mess…I sure do.